Isn’t it weird how your taste in music broadens the older you get? While I have to boast a little and state the fact that I was always open to a variety of music styles since the tender age of 12 (Wham, Bach, Chicago, Simple Minds, Brahms and the Penguin Cafe Orchestra. Is that broad enough for a 12 year old? I would hopefully think so!) I have become more encompassing the older I have become. Interestingly enough, this also includes some pretty old music. Well, not quite early baroque/late medieval grooves, but late fifties, early sixties stuff. I was already into late Bebop and early Cool, but then I started to find out about musicians like Baden Powell and Cal Tjader who would introduce an incredible South American influence into the whole genre, and somehow I seem to be hooked. I have been carrying around the classic Bossa Nova album by Getz/Jobim/Gilberto in various forms (vinyl/tape/mini disc/cd/Ipod and now again vinyl) since I was 21, but it’s introduction into my life has caused a never ending chain reaction of seeking more recordings that are similarly satisfactory to that original trigger. So now I am now again looking for vinyl that satisfies my brazilian jazz cravings. Since I have been finally equipped with a proper living room I have invested into a proper turntable and dug out my vinyl collection. This has been a revelation: the heavily compressed tracks we listen to these day on CD and Itunes just don’t prepare you for the sheer dynamic of a vinyl track in which loud is allowed to be loud and quite allowed to be quiet, so the advent of my vinyl finds of Baden Powell and Cal Tjader has been a revelation. These vinyl discs I have rescued from some obscure flea market are in gorgeous coulours, more than 45 years old and sound amazing. Yes, there is the odd crackle and pop, but my Klipsch Horns really savour the challenge of some proper dynamics on these classics, so it’s a delight to have them on turntable. 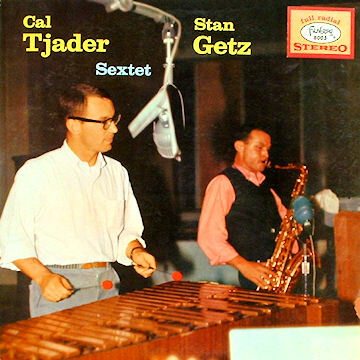 Which leads me finally to my current turntable filler: ‘Stan Getz With Cal Tjader‘ is such a cool album, I can’t overstate what a terrible hole this would leave in your record collection if you wouldn’t order it now. It obviously features Tjader’s and Getz’s virtuosity on their respective instruments, but so much more. The first seconds of the first track, ‘Ginza Samba’ miraculously shazammed such a broad smile on the best girlfriend ever’s face that I immediately knew I bought a winner. And indeed , it’s an incredible album that not only lives from the two main protagonists but also from those amazing chaps that make up Tjader’s sextet: especially Eddie Duran on Guitar and of course the great Vince Guaraldi (before he became famous with the ‘Peanuts’ soundtracks) make this unforgettable. Well, it’s gotta be better than the new JLS album, innit?? ← In praise of the Star Inn.